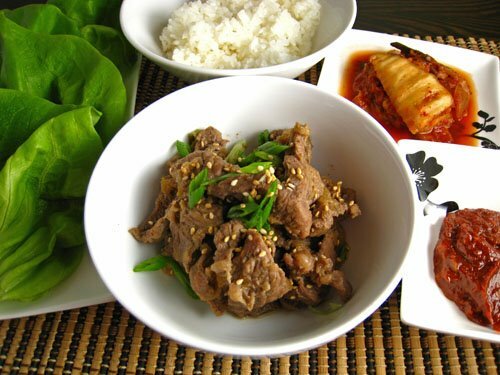 I came across this really tasty sounding recipe for bulgogi a while ago. Bulgogi is a Korean barbecued beef dish that translates to “fire meat”. I liked the fact that this recipe used a pear and an apple in the marinade to add sweetness and help tenderize the meat. The bulgogi was pretty easy to make. The hardest part was slicing the beef thinly. I found that freezing the beef for an hour made it easier to slice thinly. The bulgogi was really good. It was sweet and tasty and the beef was nice and tender. I served it with rice and kimchi and I even tried making lettuce wraps with it. The leftover bulgogi mad a great bibimbap . I don’t think I’ve ever made anything Korean. The beef looks really good. I love bulgogi and you’ve got some kimchi to the side for some heat. The apple and pear in there is a curious thing. I like the sounds of it too! I love bulgogi at Korean bbq. The apple and pear addition sounds interesting. Should be a nice balance to all that garlic! I’ve never had bulgogi, but now I really want some! I’ve always wanted to try making this! I love tat there’s pear and apple in the recipe, too. I had bulgogi for the first time while backpacking around Korea about 8 years ago. It is delicious! But I’ve never quite found it to be the same here in the States at the Korean restaurants I’ve eaten at. Now, it looks like I’ll just have to try to make it myself! Looks good Kevin! Good tip with freezing the meat too. Yum! The grated fruit sounds really interesting. I’m going to fit this into my menu this week. Bulgogi is one of my absolute favourite Korean dishes. Bibimbap as well. Never heard of using fruits to sweeten it but sounds like a good idea! I’m such a rookie – I know absolutely nothing about Korean food and really have to do something about that. I admire your guts to just go forward and do it. I love this dish, and have ordered it in restaurants. The sweetness of the fruit not only helps tenderize the meat, but also offsets the heat of the “fire”. Oh… *bleeping* yum!!! I have been wanting to try bulgogi… and especially to eat it with kimchi. Just a few more months and I’ll be able to indulge. Your food looks terrific and I’m feeling pangs of hunger just looking at the pics. Great job as always Kevin! I love bulgogi, and this looks really, really good. I think what I appreciate most about your blog is your love of Japanese and Korean food. You have a decent amount of it her and you have the ability to make it sound easy and look delicious for those who maybe don’t have the ability to eat that type of cuisine easily where they live. It’s weird b/c Korean food is one type of food I just don’t make at home because we have such amazing and cost-effective restaurants here in new york city. one day, i’m sure I won’t live here anymore, but i hope your blog is still around! Excellent. I do love Korean food. The asian pear is very subtle that you can’t really taste it but it wouldn’t be bulgogi without it. This looks and sounds really good. I wonder about using venison in place of the beef? Kevin, you did an excellent job there. I lived in Korea for a while and often crave that yummy bulgogi. You can also make it with pork (pulgogi, or that’s what we called it anyway) using the same marinade. Well done! I love Korean B-B-Q … making this! Thanks for posting the recipe. Love your site … fantastic photos! Keep up the great work. i love bulgogi! i have a much simpler recipe in my blog for it that given to me by a friend. wonder how it compares to this one? Nice recipe, we also like using pear to tenderize the meat, we sometimes use Kiwi as well. If you go to korean supermarket, they pre-slice the ribeye for you so that its easy to make bulgogi! I LOVE bulgogi. I always go to the same authentic Korean place in Chicago called Cho Sun Oak. Never tried making it myself before, but I think I will now. I had bulgogi for the first time pretty recently… loved it! So much so, that I looked up a recipe online and made it at home! I use kiwi and I've found that it really works well – both, to tenderize and sweeten.